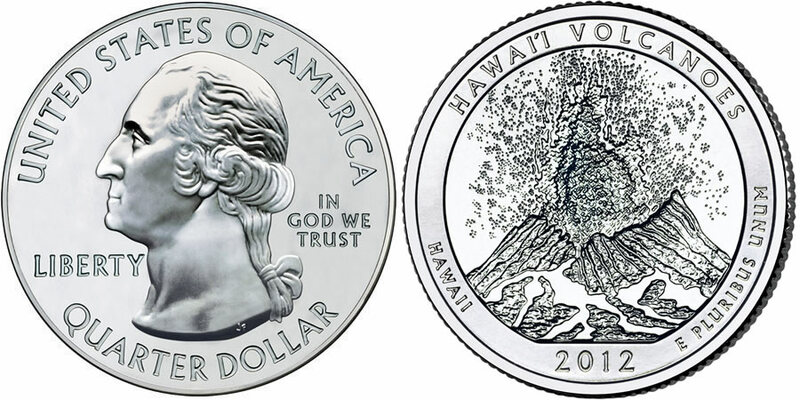 The 2012 Hawaii Volcanoes National Park Quarter will be the fourth of five 2012-dated strikes of the US Mint's America the Beautiful Quarters® Program. The reverse of the coin will contain a design emblematic of Hawaii Volcanoes National Park located in the state of Hawaii. This national park is just one of fifty-six sites of national interest to be honored in the America the Beautiful program which debuted in 2010 and will conclude in 2021. Strikes in the series are released at a rate of five per year. Honored sites represent one location from within each state of the United States, its five territories and the District of Columbia. Hawaii Volcanoes National Park was created on August 1, 1916. It is located around two volcanoes, Mauna Loa and Kīlauea. Mauna Loa is the world's most massive volcano and Kīlauea is one of the world's most active. Together, the two offer visitors a rounded view of the power volcanoes can hold. The inscriptions of UNITED STATES OF AMERICA, QUARTER DOLLAR, LIBERTY, IN GOD WE TRUST are joined on the obverse of the coin by a portrait of the first President of the United States, George Washington. The portrait was completed by John Flanagan for the 1932 circulating quarter dollar. Shown on the reverse of the Hawaii Volcanoes Quarter is a design including an erupting Kīlauea Volcano. The eruption is shown as if occurring from the east rift. 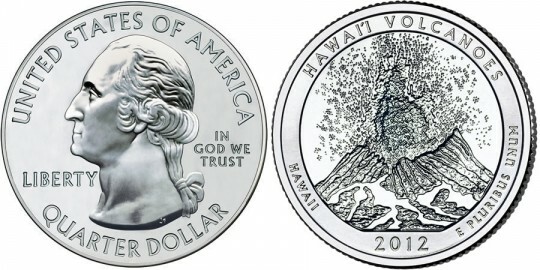 Reverse inscriptions include HAWAI'I VOLCANOES, HAWAII, 2012 and E PLURIBUS UNUM. This reverse was designed and sculpted by United States Mint Sculptor-Engraver Charles L. Vickers.